With the name of Solomon Burke in the writer credits to this 45 it has tempted more than a few commentators to think that Lukas Lollipop might just be a pseudonym for the great man. But while there are surface similarities in phrasing Lukas sadly lacks the authority and power that made Burke one of the truly outstanding vocal talents in the soul world. But despite this the famous Don’t Hold On To Someone (Who Don’t Love You) is still a very fine track in its own right. Arguably the best answer song to Joe Tex’s 1964 smash, it follows a similar structure and approach notably in the guitar and organ. And while the horns are fine the real star is Mr Lollipop himself – a hard vocalist with some lovely gritty touches and a genuine feel for the lyric. But if this ludicrous name definitely isn’t Solomon Burke who is he? Burke himself has suggested Lotsa-Poppa the Atlanta singer but to my ears that isn’t the case either. A real mystery. "I'm pretty sure Lukas Lollipop was Lotsa Poppa. I played keyboards with Poppa from 1995-2001, and we did "Don't Hold On To Someone (Who Don't Love You)" many many times, often as part of a medley. You can hear him go into a bit of it at 10:47 of this track we recorded at Blind Willie's in Atlanta GA in the late 1990s here." JT also writes with the very sad news that Poppa very sadly passed on July 14, 2014, he was 74. There is more on this sad news on my page on Poppa which you can find here. 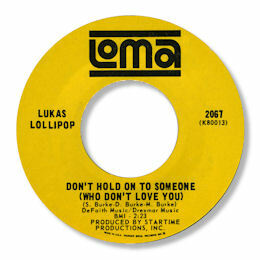 Note ~ “Don’t hold on to someone (who don’t love you)” can be found on the Warner Bros double CD “The Best Of Loma Records: The Rise And Fall Of A 1960's Soul Label”.